Razan Najjar’s death on Friday added to the 119 Palestinians that have died in protests on the Gaza-Israel border that began on March 30. Thousands of Palestinians, including hundreds of medical workers in white uniforms, took part Saturday in the funeral procession of a colleague who was shot dead by Israeli troops the previous day along the Israel-Gaza border. Relatives say 21-year-old Razan Najjar was a volunteer paramedic who had helped evacuate and treat the wounded during weeks of cross-border violence. She is just the second female fatality out of more than 119 killed since the deadly border protest campaign began in late March. “With our souls and blood we redeem you martyr Razan,” cried mourners as the body was brought to her home for a last farewell before burial. Speaking at Najjar’s funeral, Khaled al-Batsh, one of the protest organisers, called on Gazans to “continue the return marches and break the (Israeli) siege with peaceful tools”. Residents said al-Najar was a popular figure at the protest sites and pictures depicting her as an angel circulated on Palestinian social media. After the funeral, dozens of mourners headed to the fence and started throwing stones at the Israeli soldiers on the other side. 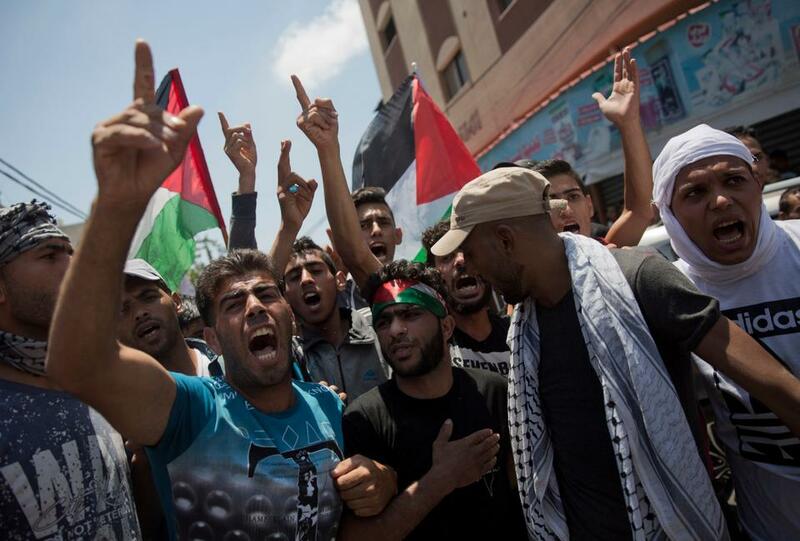 The Palestinian Health Ministry said five protesters were wounded by Israeli fire. Israeli forces killed Razan Najjar on Friday as she tried to help a wounded protester at the Gaza border, according to health officials and a witness. 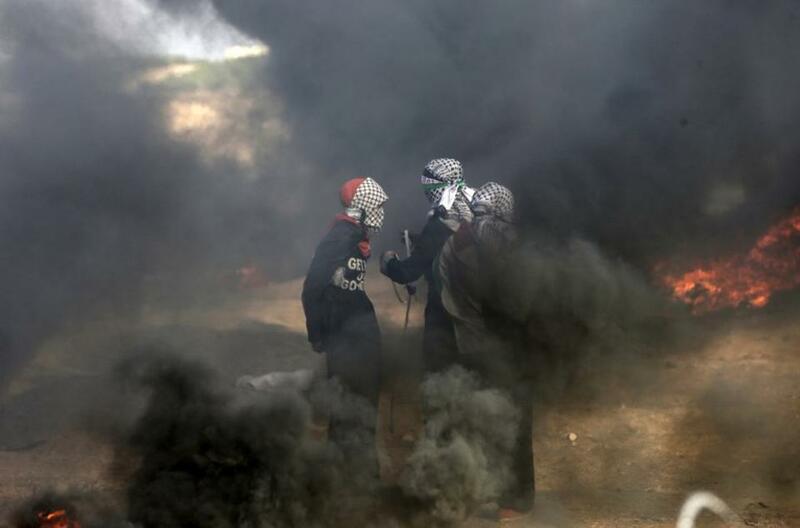 The Palestinian Medical Relief Society said Najjar was shot “as she was attempting to provide first aid to an injured protester”, with three other first responders also hit by live fire on Friday. “Shooting at medical personnel is a war crime under the Geneva conventions,” the PMRC said in a statement, demanding “an immediate international response to Israeli humanitarian law violations in Gaza”. Thousands of Palestinians thronged to the Israeli border in eastern Gaza on Friday, marking the 10th weekly protest aimed at drawing attention to the crippling Israeli-Egyptian blockade and demanding the right for Palestinians to return to former homes in what’s now Israel. The health ministry said Razan Najjar, 21, died of a gunshot wound to the chest, and over 100 people were injured, 40 of them by live fire. In a written statement on Saturday, the military said it would investigate Najjar’s death. Witnesses said Najjar was a volunteer paramedic who treated wounded protesters during the weekly demonstrations. TRT World‘s Reagan Des Vignes reports. The protests came as the US vetoed a UN Security Council resolution that asked the secretary-general to propose ways to ensure “international protection” for Palestinian civilians. Tensions soared on May 14, when the US relocated its embassy to contested Jerusalem. Over 60 Palestinians were killed that day. Robert Mardini, the International Committee of the Red Cross director for the Near and Middle East, said earlier in the week that since protests on the Gaza-Israel border erupted on March 30, Israeli troops had killed at least 115 Palestinians and wounded more than 13,000 people, including 3,600 by live ammunition. Palestinians vowed to continue protesting until the land, air and blockade imposed on the coastal enclave is lifted. A high turnout is also expected for Tuesday’s protests, which marks the 51st anniversary of the Six-Day War, in which Israel illegally captured Gaza, the West Bank and east Jerusalem. Israel withdrew from the Gaza Strip in 2005. Demonstrators at Friday’s protests waved Kuwaiti flags to thank the Persian Gulf state for blocking a US bid to condemn Gaza rocket fire at the Security Council earlier this week. Meanwhile, in occupied West Bank on Saturday, Israeli troops shot dead a Palestinian. He reportedly tried to ram a tractor into soldiers and civilians in the occupied West Bank on Saturday, according to the Israeli military said. The troops tried to stop the man after he attempted to run over an officer and a soldier with a “Bobcat” vehicle in Hebron, a military statement said. Peace talks between Israel and the Palestinians collapsed in 2014 and a bid by the US administration to restart them has so far shown no sign of progress.